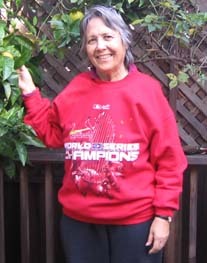 January 2007 . . .
special commemorative sweatshirt, picked out for me by my sis-in-law and brother. doing homework by kerosene lamp. then get to the games anymore, I was able to follow them on a radio, in a home that had electricity. it with me until her death at 95.5 years. the Cards win the World Series before I died.